Want to Be a More Effective, More Successful Basketball Coach? What’s the biggest single obstacle standing between you and your determination to be a better basketball coach? Is it a shortage of time to prepare for your weekly practice sessions, given the demands of work and home life? Or do you worry about your lack of basketball coaching knowledge and your limited previous experience of the game? Basketball Coach Weekly is designed to help you overcome both of those problems. And to prove it, I’d like to offer you the opportunity to take out a 5 issue trial for just $1. That’s right – this is a unique chance for you to become a visionary by signing up for a magazine that will raise your coaching to the next level. Think how much you spend on your team each year. Why wouldn’t you pay just $1 to make your life so much easier and get your players winning consistently? The current info-packed issue of Basketball Coach Weekly will be sent direct to your inbox – bursting with expert training tips and techniques you can use straight away. The next four issues of Basketball Coach Weekly will be sent to your inbox each week in just the same way as regular subscribers so you can experience the same convenient service that many other fellow coaches enjoy. Basketball Coach Weekly’s report: 9 Plays Every Coach Needs. Discover the plays that will transform your season and get your players producing results you never thought possible. Basketball Coach Weekly’s report: 10 Proven Tips for a More Successful Season. What is it that separates the haves from the have nots? Find out with this exclusive report that details how to get the most out of your team, no matter what their standard. Or keep on reading if you want more details on this fantastic service for basketball coaches. Now subscribers can access all their issues of Basketball Coach Weekly on their iPad or iPhone, through the Basketball Coach Weekly Newsstand App. There is no extra charge for this service so subscribers can have a full library of coaching sessions at their disposal on the training ground. Session not working as you’d hoped? No problem, pick another. Too few players turned up? Don’t worry, use a session perfect for smaller numbers. The Basketball Coach Weekly App is a great free addition to any subscriber’s coaching toolkit. Take a trial today and access your five issues through the App at no additional charge! What exactly does Basketball Coach Weekly do? Basketball Coach Weekly is an advisory newsletter delivered direct to your email address. Unlike most basketball coaching information, it’s aimed specifically at coaches of players from 6 to 18 years of age. And it’s written by myself and top basketball coaches, with firsthand experience of the kinds of coaching challenges you face week in and week out. That means the emphasis is very much on proven, can-do strategies for raising your game… and the success of your players. 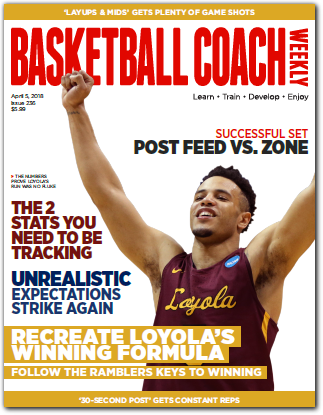 Every week Basketball Coach Weekly provides you with practical tips and techniques to make your coaching more effective and rewarding for all concerned. Our coaching experts evaluate what can go wrong in practice, problem by problem, giving you two solutions that you can use at practice today. All the articles are concise and to-the-point – and seldom more than one page in length. That’s because we know that the vast majority of basketball coaches have very little spare time. The last thing you need is pages and pages of heavy reading. So each article in Basketball Coach Weekly concentrates on the essential information you need to know. Plus, there are plenty of helpful diagrams and pictures to illustrate the important points being made, for example showing you how to position your players on the court, or perform a particular practice exercise. Here are some examples of practices and articles that have appeared in Basketball Coach Weekly. Do your players have to be the fastest, the youngest or the quickest to score easy baskets in transition? No – they just have to work the hardest. Hustle during a fast break leads to easy baskets. At Basketball Coach Weekly we have two great practice drills that will improve your players’ ability to score in transition. The first has your post player grabbing a rebound, throwing an outlet pass, sprinting the length of the court and receiving a pass in stride for an easy layup. The second is another full-court drill in which a sprinting player eventually gets the ball in his or her hands for an easy layup. Such drills can reap quick dividends in game situations. Imagine all the extra points your team could score by putting such a drill into action. Sign up here to receive game changing drills like these on a weekly basis and see the results in super quick time. From February 3 until March 27, 2013, the NBA’s Miami Heat did not lose a game. The team’s 27-game winning streak is the second longest in league history. While others relentlessly focused on the entirety of the streak as it happened, the Heat and head coach Eric Spoelstra took things game by game. When the run finally ended, Spoelstra explained what he said to his squad in the locker room after losing to the Chicago Bulls. “I had everyone come in and put a hand on each other,” Spoelstra said. “It was the first time I had mentioned the streak. After gathering together as a group, reflecting, then pushing forward, the Heat won its second straight NBA title in late June. Instead of allowing the impressive streak to define the season, Spoelstra gave the record its due, then moved forward on the ultimate goal of winning a title. 01 It was neededOnly get the team together when there is something to say to them. 02 It was appropriate The team really needed to know how to feel after their defeat. 03 It was relevant Spoelstra acknowledged the past but the feeling coming out of the locker room was to push forward. 04 It was concise It’s not what you know that’s important, it’s what the players can take. 05 It was effective Spoelstra’s team went on to win the NBA title three months later. 06 It was clear The coach spoke to his players in simple, understandable and emphatic language. 07 It had personality Spoelstra isn’t a huge personality – he is smart, determined and focused. This team talk reflected that and did not stray from who he is. 08 It motivated In this case his talk re-motivated a team that needed to know this streak wasn’t the overall goal. 09 It bonded The message brought the team back together. Nobody was blamed. 10 It was the right place The message was best delivered where it should have been – in the locker room. 11 It was immediate A coach has to be proactive when a problem is emerging and solve it quickly. 12 It changed the story Great team meetings take players from negative thinking back to positive thinking. 13 It succeeded Spoelstra was not worried about losing (it was bound to happen) but about the possible impact of the loss. 14 It cleared the mess After he’d finished, the team talk left all the players on the same (positive) page. With Basketball Coach Weekly, you can have the same galvanizing effect on your team. Find out what the top coaches are telling their players and employ similar methods to inspire your them to victory. At Basketball Coach Weekly we can’t promise that your team will embark on a 27-match winning run, but results and your players’ all-round game will certainly improve. Take the trial now. Getting a suitable sponsor can make a real difference to your team’s finances. But it is not easy and there are many things you have to think about. Ever considered how to identify your target market? Or how to price up your sponsorship plan and make your proposal as attractive as possible? In Basketball Coach Weekly we provide a 10 point plan for your team to get a sponsor. After all, it isn’t just what your players do on the court that matters. The success of a basketball team also relies on outside factors, and reading Basketball Coach Weekly will help you to influence these factors so that you have an environment conducive to improved results and player development. Players should be pushing the ball up the floor the moment a rebound is secured or the moment the opponent scores. If there are two or fewer defenders back on defense, then it only requires two or fewer passes to score in transition. To accomplish this goal of having players moving quickly in the full-court setting while scoring with a numbers advantage, it must be drilled repeatedly in practice. While running traditional 2-on-1 and 3-on-2 break drills offers an opportunity for players to see passing lanes and work quickly, Basketball Coach Weekly takes it a step further with the Blitz Drill. The Blitz Drill’s 2-on-1 segment features two offensive players pushing the ball up the floor against one defender. Once they cross mid-court, a second defender comes into play from the sideline. This creates a sense of urgency for the offense to score while having the advantage. If the offense doesn’t work quickly, the second defender has time to disrupt the break and it takes away the potential for an easy scoring opportunity. The 3-on-2 segment works in the same way. Both of these drills are more game-like in that there is constantly a barrage of defenders racing back attempting to stop a primary break. Utilize this drill and the wins will come. You’ll find all these topics, and more, in forthcoming issues of Basketball Coach Weekly . What’s more, you can suggest your own topics for future issues by emailing the editor with details of the basketball coaching issues that matter most to you. The question of reliability is of critical importance to any basketball coach who takes his or her responsibilities seriously. After all, you’re coaching a group of youngsters – including your own son or daughter, most likely. The last thing you want to do is accept any old advice. So let me tell you a bit about my experience and credentials. I’ve dedicated my professional career to advancing the education of basketball on a local, regional and national level, but my love of the game took off on the outdoor courts of my hometown in Massachusetts. It was there in the early 1990s that my friends and I spent many summer mornings playing 2-on-2, 3-on-3 and if a group of outsiders showed up, we’d run 5-on-5 with them. Even as it became clear my future wasn’t going to be spent in a NBA uniform, I knew basketball would still hold a role in my professional life. In 1998, that dream became a reality as I started working for local newspapers outside of Milwaukee, Wisconsin, shortly after graduating from Marquette University. Covering those local games involved highlighting player achievements but also allowed me a glimpse at the preparation of the coaches. I developed working relationships with several coaches who came to me first for an interview after a big game … even if I wasn’t working for the largest paper. My experience eventually led to a publishing company, which covered vastly different topics, but did feature a basketball coaching newsletter as well. Initially, I helped copy edit articles and diagrams, which provided keen insight into the Xs and Os of the game. Attending coaching clinics opened my eyes to how dedicated coaches are to their craft. I eventually moved into a freelance role with that company but one of my main duties was to put together the basketball newsletter every couple of months. I dug deeper into strategy and philosophy, and forged a more complete understanding of the intricacies of the game. As my role expanded into a full-time basis, I started attending more basketball practices, especially at the Division I level. I’d shadow the coach as he or she prepared for the workout. I’d take detailed notes during those hours spent on the court. I’d watch how the coaches connected with players in a basketball sense but also in a personal way. The best coaches, I found, didn’t scream constantly but found innovative, unique and positive methods for sharing their point. My favorite project happened a couple of years ago when I spent two weeks following a local high school girls powerhouse in my new home state of Oregon during its playoff run. I attended practices. I listened to the coaches converse. I sat in on chalk talks. I observed the pre-game preparations and halftime adjustments. And, I watched the coaches attempt to console the girls after a horrible loss. That project covered all angles of being a coach. Now, 15 years later, I take all of this knowledge and bring it to Basketball Coach Weekly. As a writer and editor, I don’t bring any preconceived notions of the best coaching methods with me to this magazine. I keep an open mind. I love hearing about unique offenses, different ways to defend and how a two-hour practice differs depending on the point in the season, the personnel, the coach and overall team goals. From youth hoops to the highest level of collegiate basketball, I’ve witnessed and reported on it all, and I promise to take this knowledge to provide you with the best coaching publication available – Basketball Coach Weekly. Sign up for your 5 issue trial, and you’ll receive your first issue within minutes of accepting our offer. That means you could be reading our advice, and putting it into action, as early as your next practice session or game day. Take the quick Blitz Drill I mentioned earlier. It’s just one of the highly effective training tips you could use to gain an almost immediate advantage over your opponents. I’m confident of two things: (1) the sheer usefulness and effectiveness of our advice; and (2) the ease with which you’ll be able to raise your game. Indeed, it’s because I’m so sure you’ll see measurable progress within such a short period of time, that I want you to try out our basketball coaching advice before you sign up to the full service. Basketball Coach Weekly is written by basketball coaches for basketball coaches. “The new format of Basketball Coach Weekly has been extremely helpful to me from a coaching standpoint as well as a reader standpoint. As a reader, I always gain insight from coaches that are at the top of their game, and how they got there and maintain that level of excellence. From a coaching standpoint, we have adopted sharing the pages of the plays with our players for their pictorial impact. It provides an outstanding visual aid that is sometimes lost with ‘Xs and Os’ or using numbers on a whiteboard. Players have been able to actually see a visual of player movement, which has been quite helpful. “I am the head Varsity Ladies Coach at Southwestern High School in Hazel Green, WI. I look forward to seeing your weekly report and I use several of the drills in practice. I try to incorporate one new drill from your articles into my week of practice just to change it up and give the girls something different to keep them thinking. I am in the process of rebuilding a program so my focus is on fundamentals and continued development. This is where I find your weekly updates most helpful. Basketball Coach Weekly is a quick hit, easy to learn and incorporate s new drills. It also comes from various coaches at all levels who are having success with rebounding, scoring, defensive transition, etc. I love the drills you have included in Basketball Coach Weekly. Each week I really look forward to soaking up all the useful information provided in each new issue. As a coach I am always learning and I am a firm believer that to be a good coach you must continue to improve your education on the game, and the more information I get, the more confident I become as a basketball coach. I have noticed the improvement in my coaching skills. I find your weekly issues the best and most informative source of information available. I coach a boys’ U16s team in Victoria, Australia, and as I am sure you would be aware, this age group thrives on hard work but also enjoy some fun drills that take away some of the pressures of learning plays, etc. For the record, our team has improved so much that we have finished the season on top of our division with a record of 11 wins and 1 loss, last season we were middle of the pack with a 30%:70% win:loss ratio. It has been a remarkable turnaround, much of the improvement can be attributed to the information supplied by Basketball Coach Weekly. Thank you for making my life as a coach so much easier. Greg Thompson, coach, U16s boys, Victoria, Australia. But you don’t need to take my word for it – or the words of my colleagues. Try out Basketball Coach Weekly for yourself for just $1! If in the next four weeks you don’t see a marked improvement in your confidence on the court, and your ability to work with your players, their parents and officials, then don’t take out a full subscription. It’s as simple as that. And don’t forget, you’ve got a full four weeks to try before you buy. To start your 5 issue trial, click on the link below now. A trial membership is just $1 through your credit card. Your Basketball Coach Weekly trial is completely risk free. You can cancel at any time during your trial and won’t be charged. You have nothing to lose when you take a trial to Basketball Coach Weekly today. So take out your $1 trial to Basketball Coach Weekly today. This is a unique chance to be involved in something special from the beginning. Become a visionary and take your coaching to the next level. P.S. Just think how much time and effort you’ll now save each week, simply by using our carefully-selected basketball coaching tips. No more searching the Internet to find something to do with your team on the weekend. And no more worrying about whether your coaching is up to scratch. It’s all taken care of for you – courtesy of Basketball Coach Weekly. Last updated 10th July 2015. Welcome to the Terms & Conditions (“Terms”) for Green Star Media Ltd (“The Company”, “Us). These Terms are between You (“The Customer”, “You”, “Your”), Green Star Media Ltd, and the trading names of subscription titles Soccer Coach Weekly, Elite Soccer, Rugby Coach Weekly, Peak Performance and Sports Injury Bulletin (“The Subscription Titles”) and/or its affiliates and they govern our respective rights and obligations. The Terms constitute the entire agreement between You and The Company related to Your membership of any of The Subscription Titles and purchases of manuals, books and DVDs (“Manuals, books and DVDs”) If you register for a membership You expressly accept that we start providing You this service within Your 14 day cancellation period, and You accept these terms, conditions, limitations and requirements. Please read these Terms carefully. Green Star Media Ltd members receive weekly or monthly delivery, by email link, to editions of The Subscription Titles for their chosen subscription period. The Company is not responsible for non-delivery of The Subscription Titles due to circumstances beyond its control including blocking by internet service providers, emails moved to junk or spam folders, or changes to email addresses not notified to Us. 1.1 Purchases of Manuals, Books and DVDs are delivered by national and international postal services. PDF copies of Manuals and Books, and eBook versions are delivered by email with an electronic download link to a web page hosting the item. The Company is not responsible for non-delivery of PDF copies of Manuals and Books due to circumstances beyond its control including blocking by internet service providers, emails moved to junk or spam folders, or changes to email addresses not notified to Us. No part of any Green Star Media Ltd publication may be reproduced in any form or by any means – graphic, electronic or mechanical, including photocopying, recording, taping or information or storage and retrieval systems – without the prior permission in writing of The Company. While every effort has been made to ensure the accuracy and above all safety of the information and advice contained in Green Star Media Ltd publications, The Company makes no warranty or guarantee as to the completeness, accuracy or timeliness of the information, and is not responsible for any errors or omissions. In no event will The Company, its affiliates or suppliers be liable for direct, special, incidental, or consequential damages (including, without limitation, damages for personal injury or related claims) arising directly or indirectly from the use (or failure to use) the information. You must register as a member before receiving any of our Subscription Titles and provide card details. We reserve the right to accept or refuse membership at our discretion. Your membership contract with us will be concluded once You receive email confirmation of Your Subscription Title membership. You may not transfer or assign Your membership. 5.1 AT THE END OF THE TRIAL PERIOD YOUR CARD WILL BE CHARGED WITH THE FEE FOR THE SELECTED MEMBERSHIP TIME PERIOD (THREE, SIX OR TWELVE MONTHS) CHOSEN AT THE COMMENCEMENT OF THE TRIAL, UNLESS CANCELLED PREVIOUSLY. NO REFUNDS OR PARTIAL REFUNDS ARE AVAILABLE. The chosen three month, six month, or twelve month membership fee for each of The Subscription Titles is stated the Help pages of the Green Star Media Ltd website www.greenstarmedia.net. This fee is non-refundable except as expressly set forth below. 6.1 AT THE END OF THE FIRST AND ANY FOLLOWING MEMBERSHIP TERM, YOUR MEMBERSHIP WILL RENEW AUTOMATICALLY FOR THE SAME TERM LENGTH, UNLESS YOU NOTIFY US BEFORE RENEWAL THAT YOU WANT TO CANCEL OR DO NOT WANT TO AUTOMATICALLY RENEW (BY EMAILING US) YOU UNDERSTAND YOUR MEMBERSHIP WILL AUTOMATICALLY RENEW AND YOU AUTHORISE US (WITHOUT FURTHER NOTICE TO YOU) TO COLLECT THE THEN-APPLICABLE MEMBERSHIP FEE USING ANY PAYMENT CARD WE HAVE ON RECORD FOR YOU. NO REFUNDS OR PARTIAL REFUNDS ARE AVAILABLE. 6.2 If all credit cards we have on file for You are declined for payment of Your membership fee, You have 30 days to provide us a new credit card or Your membership will be cancelled. If You provide us with a new card and are successfully charged within 30 days, Your new membership period will be based on the original renewal date and not the date of the successful charge. 6.3 If You have chosen to pay by Direct Debit, the following Guarantee applies. This Guarantee is offered by all banks and building societies that accept instructions to pay Direct Debits. If there are any changes to the amount, date or frequency of Your Direct Debit Green Star Media Ltd will notify You 14 days in advance of Your account being debited or as otherwise agreed. If You request Green Star Media Ltd to collect a payment, confirmation of the amount and date will be given to You at the time of the request. If an error is made in the payment of Your Direct Debit by Green Star Media Ltd or Your bank or building society You are entitled to a full and immediate refund of the amount paid from Your bank or building society. If You receive a refund You are not entitled to, you must pay it back when Green Star Media Ltd asks you to. You can cancel a Direct Debit at any time by simply contacting Your bank or building society. Written confirmation may be required. Please also notify Us. 6.4 If You have chosen to pay through a PayPal account in your name, you authorise PayPal to make payments to Us in line with the membership agreement stated on the website. To cancel this authorisation please contact PayPal. If You paid Your membership fee as soon as You joined Green Star Media Ltd, You have a cooling off period of 14 days where you may cancel at any time. If You choose to cancel within the 14 days, we will refund Your full membership fee. Any memberships cancelled outside of the cooling off period, will not be eligible for a refund. This is not applicable to trial Memberships. We reserve the right to make changes to these Terms, the Green Star Media Ltd service, our Conditions of Use & Sale, our Privacy Notice or any aspect of the Green Star Media Ltd membership from time to time by posting revisions on the Green Star Media website. 8.1 YOUR CONTINUED MEMBERSHIP AFTER WE CHANGE THESE TERMS CONSTITUTES YOUR ACCEPTANCE OF THE CHANGES. IF YOU DO NOT AGREE TO ANY CHANGES, YOU MUST CANCEL YOUR MEMBERSHIP. We may terminate Your Green Star Media Ltd membership at our discretion without notice. If we do so, we will give You a pro-rated refund of Your membership fee. However, we will not give any refund for termination related to conduct that we determine, in our discretion, violates these Terms or any applicable law, involves fraud or misuse or is harmful to our interests or another user. Our failure to insist upon or enforce Your strict compliance with these Terms will not constitute a waiver of any of our rights. Green Star Media Ltd will be responsible for any losses You suffer as a result of us breaching these Terms if the losses were reasonably foreseeable to both You and to us when You joined Green Star Media Ltd. We will not be responsible for any business loss (including loss of profits, revenue, contracts, anticipated savings, data, goodwill or wasted expenditure) nor will we be responsible for any other indirect or consequential loss that is not reasonably foreseeable to both You and us when You joined. 10.1 Green Star Media Ltd does not limit in any way our liability by law for death or personal injury caused from our negligence or breach of duty or caused by our gross negligence or wilful misconduct. Subject to the proceeding sentence, our maximum liability to You will not exceed the last annual membership fee You paid. Green Star Media Ltd, Tannery Lane, Bramley, Guildford, Surrey GU5 0AB. I have read and agree to the Green Star Media Ltd Terms and Conditions. We take security and the safe handling of your confidential personal information very seriously, and have taken all possible steps to make our online ordering process secure. The order page you are viewing is stored on a secure server. This is authenticated by the padlock icon appearing in the address bar of your web browser. Entering information on a secure page means no one else using the internet can see the data.